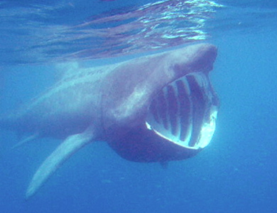 Basking sharks have grey skin and can grow up to 10 metres long. They live near the coast where the water is warm but are harmless to people. They swim slowly along with their mouths open to catch small fish.